Long live Jose Marti. While sitting in the classroom within Marti’s only son’s residence, the ambiance was overwhelming. Dying at the early age of 45, Marti’s life was more fulfilled and impactful than most will ever have. Poet, writer, and political leader, Cuba preserves the residence of Jose Francisco Marti to dedicate a center to the studies of his father’s life work and impact on Cuban culture. 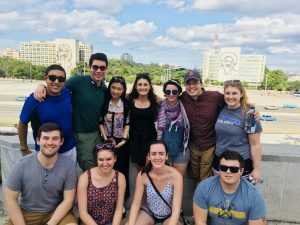 Today, the center is used to welcome students from all over the world and educate them on the Cuban history and what it means to be Cuban. dedicates its existence to keeping the adventures, hardships, teachings, and examples of Marti’s life alive. Comparable to America’s George Washington, Marti represented the ideal ethics and values of the Cuban people. Born January 28, 1853, Marti was the oldest son of two Spanish immigrants. Though his life was short lived, it was rich with traveling to seven different countries due to his ‘radical’ political ideas. His travels enabled him to have modern knowledge from various parts of the world and have similar thinking’s of America’s enlightened like Emerson and Hawthorne. His ceaseless creativity drove Marti to author two novels and compose thousands of other short writings. The center has preserved 2,000 of his works and expects there to be thousands more of undiscovered pieces out there. 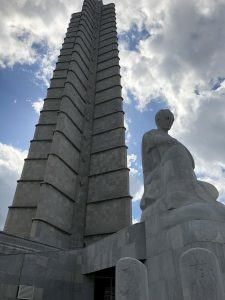 Jose Marti is such a core element to Cuba that it is often said Marti is a religion, something that all of Cuba believes in and worships, like a God. Aside from the Jose Marti studies center, Cuba has a memorial in honor of their revolutionary hero. As the tallest building in Habana, the Jose Marti memorial captures the beauty of the entire city in five points. The building resembles a star shape, like that of the Cuban national flag. Fulgencio Batista personally oversaw the assembly of the monument, collecting one day’s pay from every Cuban citizen; however, never disclosing how much money was collected. The interior wall of the structure displays quotes from Marti written in twenty-two carrot gold imported from Venice Italy surrounded by twenty eighty columns with gold plating as well. The number twenty-eight is symbolic of the twenty-eight camps that Marti stayed in before the first battle of the revolution, that he died in. 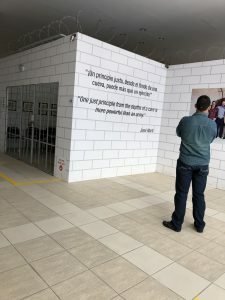 One quote of Jose Marti’s that I personally loved was written on the wall of the Museum of Arts in Cuba; it read “Un principio justo, desde el fondo de una cueva, puede más que en ejército!” Translated in english it means “one just principle from the depths of a cave is more powerful than an army”. This quote is symbolic on the Cuban culture because it signifies the ideal ethics that Marti was so passionate about. Reading the quote, I interpreted it as a just idea, like ones belief in freedom, is an idea more powerful than army. This is symbolic to the fight the Marti started for Cubans freedom. Standing within the luxurious memorial, overlooking the beautiful colonial city, there is an enlightenment that hits you. This is Cuba. Self-governed, despite all the obstacles they faced and countries who denied their sovereignty, their patriotism persisted. Jose Marti sparked this sense of identity and made it all possible. His face is displayed everywhere (literally everywhere, whether it be abstract, sculptures, or captured in a quote), because Cubans are forever inspired by him. Today, Marti continues to drive the people’s determination to remain independent and sovereign. He set the standard of what it means to be Cuban, to be honest, kind, passionate, and to hold your values high. To be Cuban is to be resilient; to persevere in the hardest of times. Having the opportunity to learn about the ‘special period’ was both eye opening and heart wrenching. The struggles put on the Cuban people due to the trade embargo are unimaginable. The distances that they had to walk everyday just to work or get an education, the shortage of food, and the cloud of darkness that loomed over what the future would hold, yet they pushed forward and created a culture that believes in helping those around them and creating a type of community that I have never seen before. Marti set the standard and inspired this type of nationalism, and will forever be a massive part of their culture. Preservation: What will withstand the test of time?